This week, I am pleased to bring you another Colorado brewed beer, but one that you can find in NYC now! Back in April I visited the Crooked Stave brewery, which only brews sours and is located in a market (called The Source) reminiscent of a smaller and more industrial version of NYC’s Chelsea Market. If only Chelsea Market had a cool brewery in it! At the brewery and later at the What The Funk!? sour beer festival, I had the opportunity to taste over a dozen of the breweries beers, but surprisingly, it wasn’t until I made the long journey home to NY that I was able to find a bottle of Hop Savant. This beer pours with a nice foamy head, the bubbles of which linger on the glass long after it settles. As you can see above, this beer is YELLOW(!) and hazy. This beer must be bottle conditioned because a surprising bit of yeast tried to escape from the bottle prison to the freedom of my glass, which would also help explain some of the bottle haze. Because this batch (#2) was brewed back in 2013, some of the dry hopping flavors and aromas have dissipated, but I imagine that when this brewery catches on in our city, obtaining fresher bottles will be easier. The aroma of this beer is extremely tart, almost like lemon juice. The hop aroma had completely faded, and I couldn’t smell or taste any oak essence from the foeders. Nor could I taste the piney Simcoe and Centennial aroma hops, which was slightly upsetting since a hoppy Brett beer was what I was excited for. The first impression taste was HOLY CRAP THAT’S TART, which I guess is what you get from a 100% Brettanomyces beer. The tartness was followed by a strong bitterness on the back end, so there were definitely a lot of hops added early in the boil. The tart flavor didn’t mellow out as the beer warmed either, and the bitterness turned more pronounced, as did a bit of a band-aid aroma, which some sour fans dig. The body was nice and light, and despite being supremely tart, the mouthfeel wasn’t all that dry. 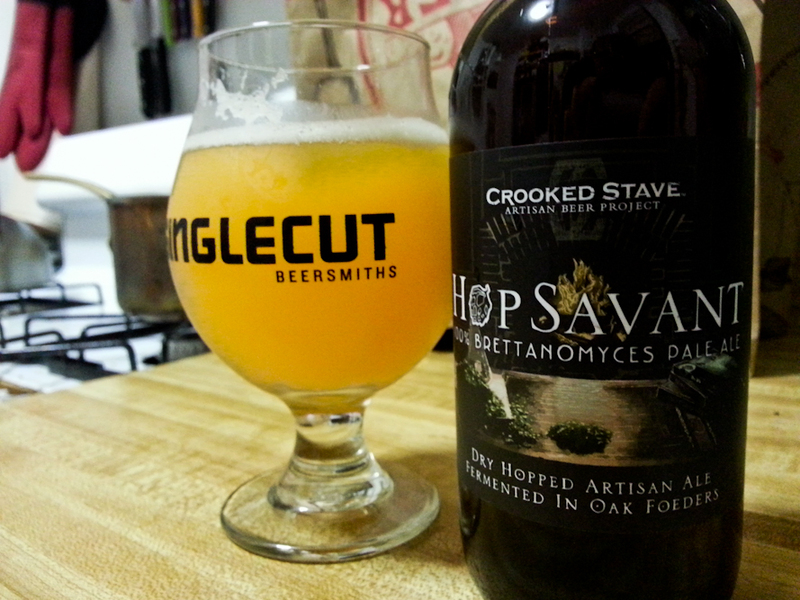 Overall, I am a fan of Crooked Stave brewery and many of their beers. When I was at the brewery, I had a taste of their Batch 60 on tap, which was another dry hopped sour that very much retained the hop aromas and paired nicely with the funkiness. Next time I’m going to look for a fresher bottle. May 29, 2014 in Beer.